Well. Kyung Soo is learning what his obedience to his father-in-law has really done to people and he’s not happy. Since Mi Soo has now learned about Sun Hee…when will she learn that Sun Hee is Na Young? And when will Baek learn that Mi Soo is his beloved Eun Joo? There’s a hundred episodes…it can take quite a while I am sure. Myung Ja immediately accuses Mi Soo of stealing and demands to know what Mi Soo did with the jewelry. Before Mi Soo can answer, Myung Ja gets faint and then screams that nothing can replace what her dead husband gave her. Mi Soo apologizes, but says she wasn’t the one who took the jewelry. That doesn’t matter to Myung Ja who reveals that she heard Yoon gambled away the 30 million Min Jae gave him. Myung Ja then accuses Mi Soo of coming to work at CK just to land Min Jae. Mi Soo cries and says that isn’t true, but Myung Ja doesn’t believe her. She screams again and nearly passes out. Mi Soo goes to help her, but Myung Ja screams at her to get out and bring divorce papers. When Mi Soo doesn’t immediately leave, Myung Ja screams even more and starts throwing everything on her desk at Mi Soo who finally leaves. Na Young sees this with a big smile as Myung Ja sits down and passes out. Of course, Na Young won’t leave Mi Soo alone. She talks about how unwell Myung Ja looked all day and how Mi Soo must have done something to disappoint her again. Why can’t Mi Soo try to please her for once? Mi Soo says she has nothing to talk to with that girl any more and walks way. Na Young then goes into Myung Ja’s office where she finds the older woman passed out. She happily smiles. Hong Eun Joo made a royal mess this time. Na Young then coldly tells the older woman to hurry and get up as there is still things she must do. 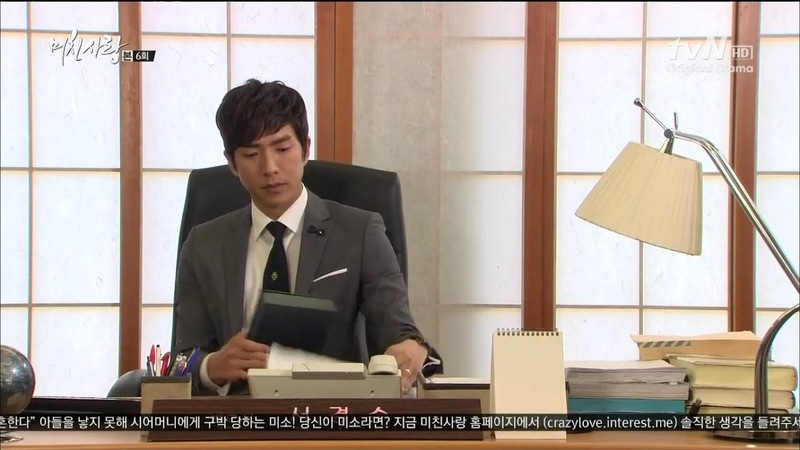 Enter Myung Ja’s assistant and Na Young pretends to be all concerned again. What happened? She must have collapsed after arguing with her daughter-in-law. 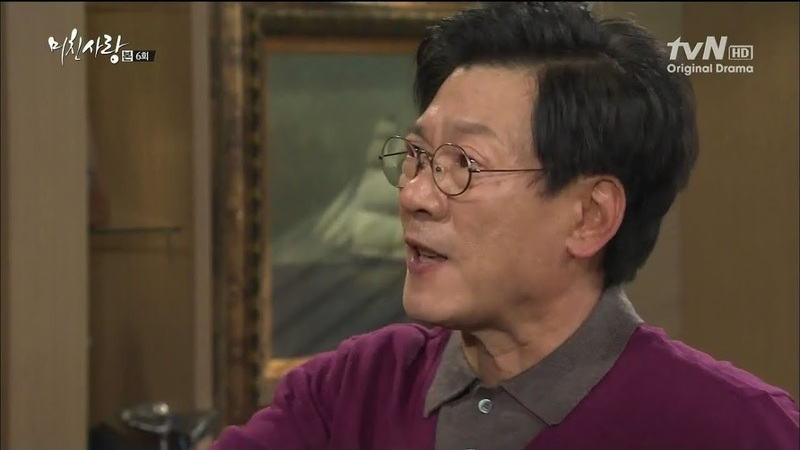 Na Young says Myung Ja should be more careful because of the woman’s blood pressure. 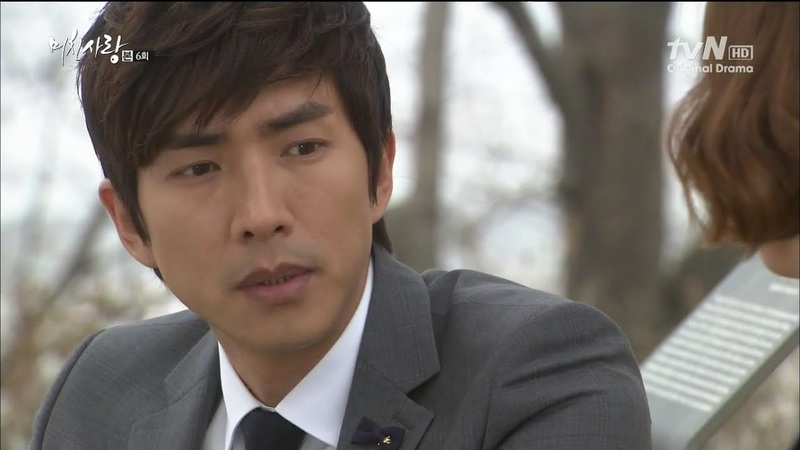 The assistant leaves to get help and Na Young calls Min Jae to tell him about his mother’s collapse. Mi Soo sits crying on the stairs. She tries to gather her emotions and gets up only to run into Myung Ja’s assistant, Ko, who tells her Myung Ja collapsed after talking to her and was rushed to the hospital. 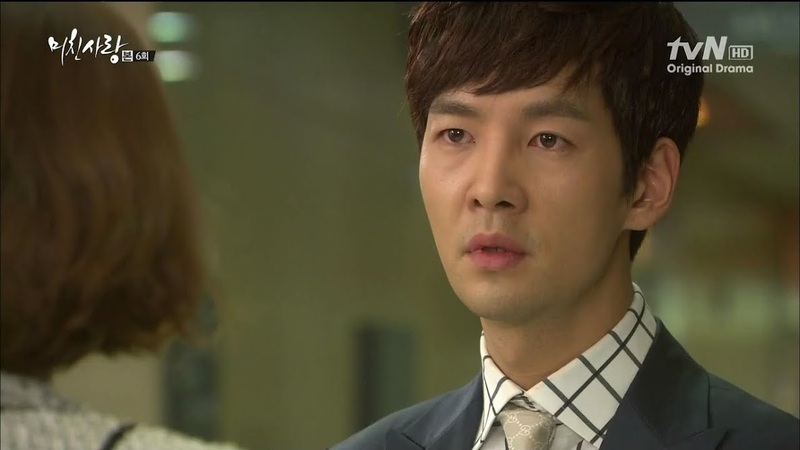 At the hospital, Min jae is bawling Ko out for not taking care of his mother properly. Ko says he wasn’t by her side as Myung Ja wanted to talk to Mi Soo alone. His wife? Min Jae turns to Na Young. Does she know why Mi Soo was there? Myung Ja called her over as she was upset all morning because of something Mi Soo did. Min Jae mutters under his breath about not being able to get a break. Na Young then says she saw Mi Soo rushing out of the office and that is when she went in and found Myung Ja passed out. She assumed that Mi Soo went for help, but she guesses not. Did Mi Soo not know his mother fainted? Na Young doesn’t think so. Enter Mi Soo who asks what happened. Is Myung Ja okay? What did the doctor say? Na Young replies that Myung Ja still hasn’t regained consciousness. Mi Soo doubles over. This is all her fault. Na Young tells her not to worry too much as they found Myung Ja early enough so she should be okay. At JR law firm, Kyung Soo is going through Yoon’s file and recalling when Yoon came to beg him for help. However, Kyung Soo apologized and said there was nothing he could do at all to help the man. Yoon breaks down crying and Kyung Soo pulled out his wallet and gave all he had to the man. Yoon angrily tears up the money and says he would never feed his family with that dirty money. Poor Kyung Soo is tormented. How could such a thing happen? Baek then enters. Kyung Soo tells him to sit down and joins him on the other couch. Why did Kyung Soo ask to meet with him? It’s about Yoon Moon Do’s case. This surprises Baek. Back at the hospital, Mi Soo recalls Myung Ja screaming at her earlier. Min Jae asks why his mother was upset at Mi Soo that Myung Ja called her in and then collapsed. Mi Soo doesn’t get a chance to say anything before Min Jae asks if she really didn’t see his mother collapse. How can he possibly think she’d just leave his mother lying there? He should know here better than that. Mi Soo is speechless—how could he say that? Myung Ja then asks why she wasn’t told earlier. Na Young helps Myung Ja sit up and Myung Ja starts accusing Mi Soo of horrible things like stealing and selling her jewelry and purposely trying to make her blood pressure rise to kill her. Omo. What a sadistic old woman. Mi Soo quickly denies this. She is not an evil daughter-in-law. Wow. It looks like Myung Ja’s little fainting spell did nothing to her brain. She’s quick on her feet to make up a bunch of lies to make sure Mi Soo gets kicked to the curb by Min Jae as she says that Mi Soo coldly closed the door on her while she was screaming for help. She never screamed for help and when Mi Soo tried to help her, she screamed even louder at her. Min Jae asks if that is really true and Mi Soo denies it. She then tells Myung Ja that she only left because Myung Ja screamed at her to leave and she was afraid of Myung Ja’s condition worsening. Myung Ja then starts doing it again and even goes to take out her IV to leave if Mi Soo doesn’t. Na Young holds her and urges Min Jae to take Mi Soo out. Back at the firm, Kyung Soo is warning Baek up his illegal doings. Baek cannot believe this. As a lawyer, hasn’t Kyung Soo seen enough debtors trying to cheat the lenders? So was it proper action to go into the person’s house like a robber and take things? This piques Baek. Did Kyung Soo just call him a robber? Baek then says he doesn’t see any difference between what Kyung Soo does and he does. Baek uses his fists to get money out of poor people while Kyung Soo uses the law. Baek then says he is only following his boss’s orders and that has nothing to do with Kyung Soo. Baek gets up to leave, but Kyung Soo says one word—“sit.” Baek turns to look at him. Why is he getting so worked up over this case? Does Kyung Soo have some sort of personal agenda? Kyung Soo stands and then comes up with a very quick lie. He’s worried how illegal actions will reflect on his father-in-law, thus Baek needs to give back all that he’s taken, which Baek refuses to do as he only has one boss and that most definitely isn’t Kyung Soo. Baek goes to leave and Kyung Soo yells at him to stop. He will report the matter to Oh himself and Baek must do just what he says. Baek leaves the office and we flashback to a time when Oh was beating him. Why? He talked back to Kyung Soo and questioned something he was asked to do. 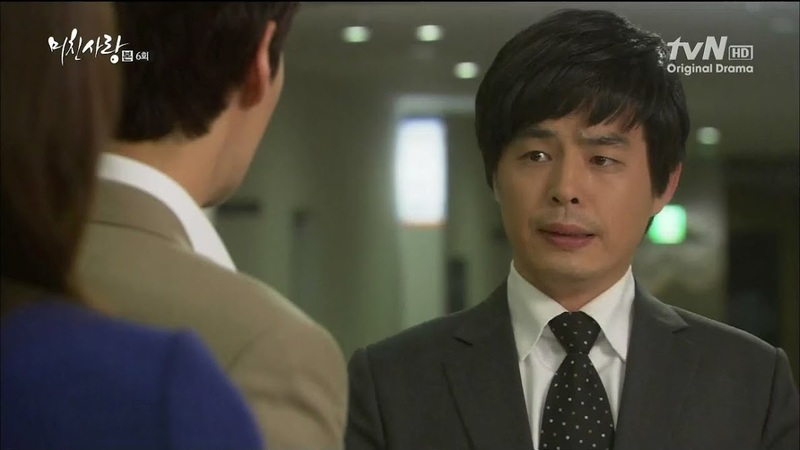 Kyung Soo tries to stop his father-in-law and diffused the situation, but to no avail. Oh demands Baek apologizes to Attorney Seo. Baek then gets on his knees and Oh tells Baek to treat Kyung Soo as he treats Oh. You can see Kyung Soo’s unhappiness at this order. The flashback ends and Baek looks back at the firm and smirks. What’s going through his mind? Mi Soo is with Hae Ram who is sleeping. She says that she is having a very hard time right now. It feels like she’s walking on very thin ice and everything can disappear on her in an instant. What can she do? Nothing like asking a sleeping child that question. Really, what can Mi Soo do? There really isn’t anything she can do. If she fights she hurts those around her and herself. If she doesn’t fight, it’s the same result. Let’s face it—she’s damned for the time being. At the Oh household, the family is sitting down to dinner when Mrs. Go reveals she heard Myung Ja collapsed. This is news for Kyung Soo. Oh asks what happened and Mrs. Go replies Myung Ja called in her daughter-in-law and collapsed afterwards. Why would she call her daughter-in-law into work to scold her? Mrs. Go says the daughter-in-law comes with baggage. Apparently her family owes a lot of debt, plus Myung Ja is hoping for a grandson and her daughter-in-law becomes infertile. Go cannot blame Myung Ja. Well…I can. More irony. Really. Oh wonders how come the debt can’t be paid off since the family is so rich? LMAO. Guess he doesn’t know that Yoon’s daughter married into the Lee family. Oh then says he hates people who don’t pay back their debt quickly the most. 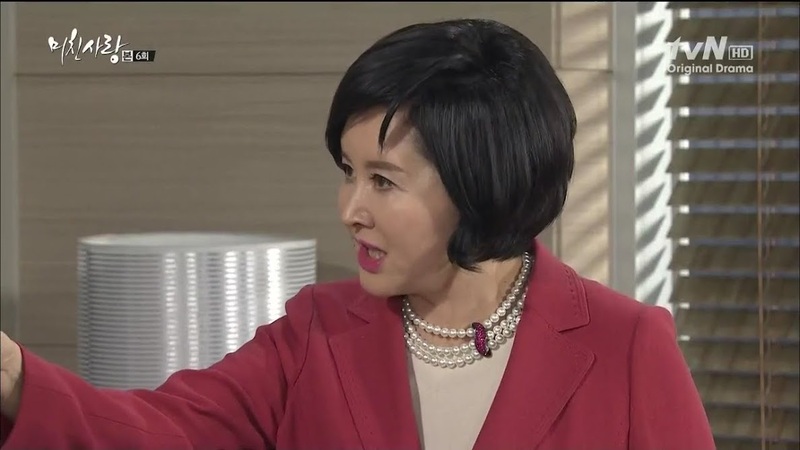 Hae Ryung then asks if the surrogacy rumors are true. Go confirms this and says that not only that, but Myung Ja is looking for a new daughter-in-law, too. Kyung Soo looks horrified at this news. Back at the Lee home, Mi Soo calls her husband to ask how Myung Ja is doing. She is happy to hear that Myung Ja is doing better and says she will go to the hospital later around lunch time when Min Jae will go, too. He tells her to stay home as he doesn’t want his mother’s blood pressure rising again. Mi Soo is horrified. Don’t tell her that he thinks she really did leave his mother lying on the ground after her collapse? Min Jae demands she stop talking about the matter. What a great husband. Mi Soo stops talking about it and Mi Soo promises she will only go to see how Myung Ja is, but won’t go into the room. She also wishes to clear up the misunderstandings between them. The doorbell rings and she hangs up. Kyung Soo is given more paperwork from the Yoon case and learns that Yoon’s wife died of a heart attack shortly after he lost the factory four years ago due to the shock. Yoon lives in a one bedroom apartment with his son Chan Ki who suffers from kidney failure. The daughter married the heir to the CK group and thanks to her husband, she paid off some of the debt. However, it seems she has suffered through a lot. Kyung Soo thanks his assistant and sends him away. Before he goes, he hands over a box from Baek which contains all of the jewelry. Na Young comes to the house and Mi Soo tells her to get out. Na Young says it is a task from Myung Ja that she pack up Min Jae’s and her clothing as they don’t know how long she’ll be at the hospital. Mi Soo doesn’t care, she’s not letting Na Young touch her husband’s things. Na Young then says it is no wonder Myung Ja hates Mi Soo as much as she does. Mi Soo doesn’t have the qualifications to be Min Jae’s wife or Myung Ja’s daughter-in-law. Na Young then asks Mi Soo to be honest—wasn’t she hoping her horrible mother-in-law would die when she left her collapsed on the floor? Mi Soo hauls off and slaps the other girl. About time! Na Young then slaps her back and tells her to wake up and face reality and then throws her to the floor. Na Young then has an inner monologue about Mi Soo’s suffering not being enough for what she’s gone through for the past 20 years. she then leaves. Kyung Soo and Hae Ryung get good news that they are both healthy and should be able to have a baby (I still don’t think they should). The doctor encourages them to try natural methods before trying out artificial insemination. Meanwhile, Myung Ja plans on staying in the hospital as long as it takes to get rid of Mi Soo—she’ll even move into a hotel if she has to. Fine. Min Jae then says since his mother is going to do this, he and his family will move out of the Lee house. This horrifies Myung Ja. She spies Mi Soo and asks if she asked Min Jae to move out since she hates Myung Ja so much. Myung Ja begins throwing things once more and Min Jae takes Mi Soo out of the room. Mi Soo immediately scolds him for saying such things when his mother is sick. Min Jae says he’s tired of everything. He then asks Mi Soo to move in with her family for a few days until his mother calms down. Mi Soo says she will talk to Myung Ja, but we all know that won’t go over well. Min Jae then looks at Mi Soo’s bare ring finger. She gave it to those guys, didn’t she? And after he had just bought it. Mi Soo apologizes and says she had wanted to tell him, but Min Jae cuts her off. Min Jae reminds her today is her mother’s death anniversary. When she goes home for that, she should just stay for a few days until they can get Myung Ja out of the hospital and calmed down. Mi Soo ignores this and says while it may sound like an excuse, she really didn’t steal Myung Ja’s jewelry to sell. She also swears to God that she didn’t know Myung Ja fainted. Min Jae should believe her more than anyone. Min Jae says that he does, but he’s sick of both her and his mother. Kyung Soo arrives in time to hear Min Jae say this. Min Jae goes on to say he dislikes both Mi Soo and his mother right now. And quite honestly, he understands how his mother feels. Why doesn’t Mi Soo try to put herself in Myung Ja’s shoes? Min Jae then says they should just drop the matter and end it all. He shouts and walks away leaving Mi Soo to cry alone. You can see how much Kyung Soo is hurting for her. Hae Ryung then comes up all bubbly and happy. Kyung Soo reminds her to take it easy as per doctors orders and she easily agrees. Mi Soo goes for her mother’s death anniversary and Yoon cusses out Oh and vows to end his life with his own hands. Yoon apologizes for being incapable to his dead wife. Mi Soo tries her hardest to fight back her tears. She then has Jong Hee take her to the orphanage. Jong Hee cannot believe Mi Soo is going like normal when so many bad things have happened to her of late. Mi Soo says she can’t disappoint the children as she knows how hard it is to wait for someone who does not come. Jong Hee then says it must be because the orphanage’s name has angel in the title that Mi Soo is like she is as she is so like an angel. This does make Mi Soo laugh at least. Mi Soo says that Jong Hee doesn’t have to pick her up, but Jong Hee insists since she is borrowing Mi Soo’s car. Mi Soo is in the cafeteria with the children making sugar cookies. She does her best to put on a happy face, but every now and then the sadness creeps through, but she does her best to shake it off and keep smiling for the kids. Meanwhile, Kyung Soo looks at the jewelry and recalls what Mi Soo said about going to the orphanage every other Wednesday. He checks his calendar and sure enough, that’s today. What will he do? Mi Soo walks outside recalling Min Jae’s harsh words. She sits down on the bench and sees a carving on it. We flash back to little Sun Hee (Na Young) angrily crossing out Hong Eun Joo’s name (the bench basically said Baek loves Eun Joo). This is seen by Eun Joo who looks scared at how vicious Sun Hee attacks her name. 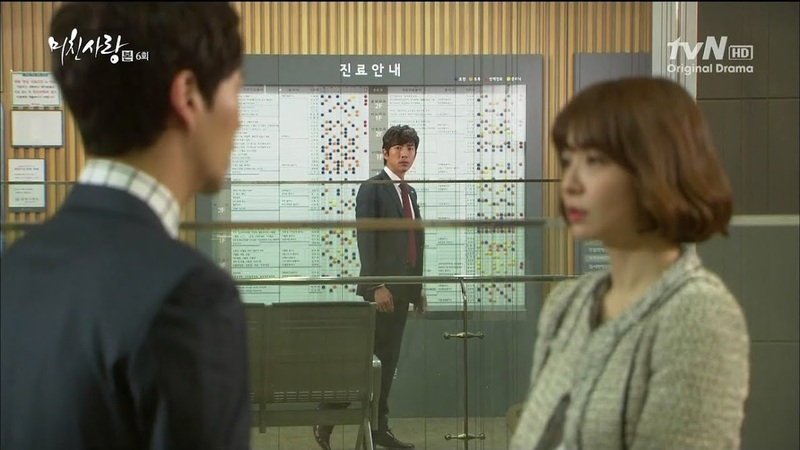 This causes Mi Soo to ask the headmistress about Sun Hee. The headmistress does remember her—she was a very jealous child who had a rough life after she was adopted. 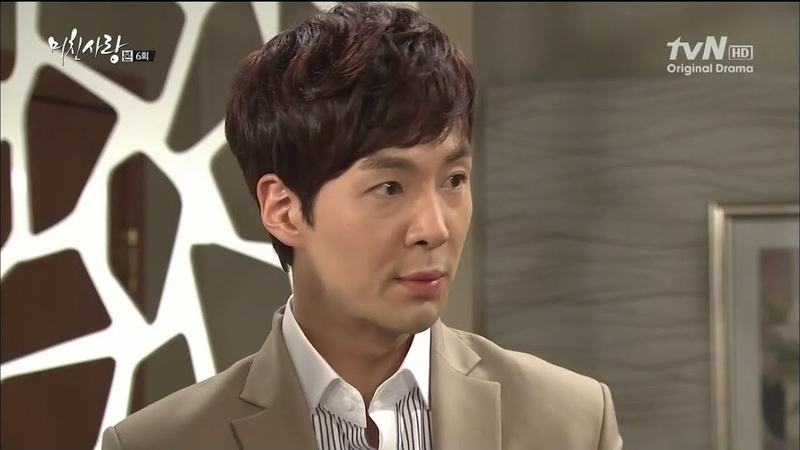 The headmistress then says that Sun Hee was originally supposed to be adopted by the Yoon family. Mi Soo is shocked to learn this. The headmistress tells her not to feel bad as it’s not her fault. In fact, it is God’s will that she was adopted like that. Rather…it was Baek’s. Kyung Soo then arrives and gives Mi Soo back the jewelry. She is so happy. How did he do it? Kyung Soo says he threatened Baek with the law so now Mi Soo should be able to pay of the debt little by little—but it will be difficult. Kyung Soo then says he didn’t notice her car—does she need a ride? When is she leaving? Mi Soo replies in about an hour, but she will go to the hospital instead of home (because she’s a glutton for punishment). Kyung Soo then says he’ll drop her there on his way to the office and he rushes off to go play soccer with the children. On the way back into the city, Kyung Soo glances at Mi Soo and notices her head lolling as she has fallen asleep. At the hospital, both Na Young and Myung Ja are in a good mood, both happy thinking they have triumphed over Mi Soo at last. Na Young’s happiness is short lived when Myung Ja mentions calling her parents in the US. Looks like the girl is lying about her past. What will she do now that Myung Ja is requesting to meet her parents? Min Jae then comes in to take his mother home. Kyung Soo arrives at the parking garage and recalls all the past things he’s heard and witnessed. Mi Soo is still fast asleep. He takes a pillow from the back to lay Mi Soo’s head on and when he looks up there is Mi Soo’s family. Of course, Min Jae sees Kyung Soo with his wife. What will happen next? Well…at least it doesn’t look like Min Jae accuses her of cheating, but it does look like she is going to be exiled to her father’s house while Min Jae promises to bring her back.